[SYSTEM FEATURES] The real 3D effect, super visual enjoyment! Support dual Screen HDMI+VGA, HDMI 1080P output; Dual decoding function, allowing you preview a song while you play the other song.The design of “video in picture” function, let you see watch video of TV at touch screen monitor side.Songs vocal on/off Select songs by language, song name, artist name, index number, category, and char numbered. [FUNCTION FEATURES]The design of “Favorite” function, remember all your favorite songs into “favorite” list, no need to select your favorite songs every time powering on the machine. Ranking design: It will automatically remember and rank selected songs. Frequent select songs will be rank top 1. You could easily see the hottest selected songs.It will continuously count every time you use the machine. Score function: Display score after singing. [ADD AND SELECT SONGS]New song design: When you add songs to the machine, it will automatically set them as new and you could easily get them in the “new song” list. Select songs: Support selecting songs via wireless keyboard and mouse, mobile device like mobile phone, Ipad. Add/Play song: video files from U disk. [PARAMETER]:Output resolution: 1920*1080/1280*720/720*480 . Screen Inch: 22ââ. QTY of songs preloaded 150,000+(20500 Mandarin DVD songs,56000 English CDG,VCD,DVD songs,40000 Thai VCD DVD Songs,10000 Vietnamese DVD Songs,9000 Khmer Songs. ); Input Voltage: 12V 4A (110V-240V adapter) ; Power consumption :< 48w. 1.VCD Songs file is 480P.DVD Songs are with 720P resolution.1080P HD file is very big,4TB HDD only could preloaded with 5-10K 1080P Songs.It is not suitable for karaoke machine.The video quality has been enough for karaoke singing. 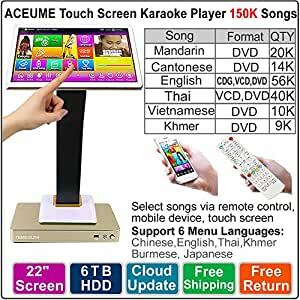 If you expect the karaoke songs video display has the same effect as 1080P HD film on your BIG TV.No any karaoke seller could meet this expectation. We suggest you to make decision after full comparison. 3.We cherish every customer.We have been trying our best to provide the best product and service for customers.After receiving and testing the player, if you found it has any problem, we could provide free exchange and return service.But we need your communication first because sometimes it just because the operation is improper or the cable is loose during transit.